This is a momentous time to correct the grave mistake that was committed some 20 years ago and left our beloved church splintered. Look, unless we do the right thing now, it is saddening to see a divided and weakened Orthodox Church we will pass to the generation to come. We need to step back and think before we start beating the drum of electing another fake patriarch. We must not repeat the very mistake that caused us so much trouble. Remember, how the deceased, came to power 20 years ago. It was orchestrated by TPLF to control and weaken the church. If there is any one out there who believes Patriarch Merkoriwos relinquished his position due to ill health, I would say he/she must not have been observing what the TPLF has been doing to justify every atrocity it committed against our church and Ethiopia in the past two decades. Read the diplomatic cable released by wikileaks on what the then PM Tamirat Layne, now menafik, told to the US Embassy about how they caused the division of our church. The damage the late Aba Gerbremedihin aka Aba Paulos has caused is enumerable. Look how we are responding to the death of a person whom we would otherwise have mourned had he assumed the position legitimately according to canon law, had he done the right things to the church, and had he been on our side. However, the most glaring damage of all, I think, is the DIVISION he has brought to the Ethiopian Orthodox Church, and his complacence while the age old monastery, Waldiba, is being desecrated. He is now gone. God is the judge here. It is a relief for the church that he is gone. Now, the most important question should be how we can restore unity, dignity, and holy leadership going forward. This is the time to think how to solve our Church's most pressing problem, the division. It is time for soul searching and praying to God for guidance, and not a time to simply vent our emotions. I consider three possible scenarios about the leadership of our church following the passing of Aba Gebremedihin. 1. We acknowledge Patriarch Merkorios as the head of the church for his life span, however long that may be, and eliminate the very reason that led to the division in our beloved church, which is appointing a patriarch while a living patriarch exists. This scenario must be entertained courageously just for the sake of uniting our church regardless of the bickering from either side. 2. TPLF will orchestrate a fake election and assign another cadre and try to maintain the status quo leading to a continued suffering of our beloved church and its followers. 3. A seemingly free election may be held by the synod in Addis and the fathers choose one amongst themselves. This will still be assigning another patriarch against the cannon low of the church while a legitimate one is still alive. This will guarantee the perpetuation of the very problem that divided our church for the past 20 years. We are fed up of the division, trivialization of our values, corruption in the church, desecration of our holly places, etc. We are tired of the weeping, the heart aching and helplessly murmuring as we witness ill being done to our Orthodox Church. 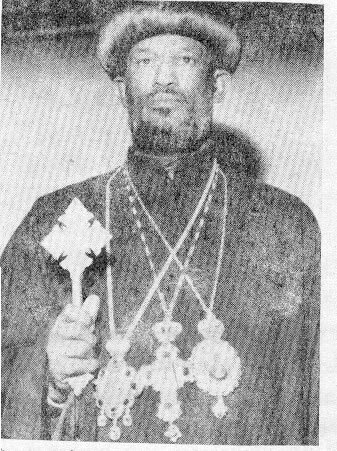 I pray to God to give the fathers of the church to use this opportunity to heal the division the late Aba Gebremedihin caused to the church. For the purpose of mending the splinter in the church, restoring the legitimate Patriarch, Abune Merkorios, is the best scenario. Unless God does his divine intervention, such a wise idea to solve the church's most significant problem is less likely. TPLF may likely assign another cadre. This is what we fear as human beings, but God's plan and work is supreme as we are witnessing these days. Our church may at last be united or remain divided. We shall see. May God bless our church and Ethiopia! Nefis Yimar Lemotut. It bothers me when young people think like uneducated, archaic idots. Not spiritual ones, just down right useless old retards. What do you expect from Ethiopian government. "Yemengst Fekad hono" Idiot. what government. Woyane. Woyane will only allow to have a faher appointed who will fulfuill thier interest to repress people, creat choas, ensue division and destroy the church. All woyane want is what is not good for its people. IF the appointment of the church will unite you, woyane will want a father like paulos who will devide. It is sad young people are waiting for this myopic junta to do right. I don't know who thought you. It embarasses me that we share citizen ship. young people the only way is to question authority, including old, draconian, blotted so called kesis and abunas. Their did stinks. They are not our fathers they are just piece of human waste that go around eat our food, drink our TELLA , east our foo, rob our money and send us to hell. they are nothing but diablos himself in long robs, long beard and a fancy hut. Empty drobs devoded of spirtuality and fatherly guidancy. The almighty God thyself created an opportunity for this church to repair its broken order. As a faithful member of the Ethiopian Orthodox church, I suggest not to repeat the same mistake that brought our church to its knees. Whether its from Gonder or Tigray or Wolega, we are one in the kingdom of heaven. We should also learn what the Egyptians do when their government arrested the head of the church and demanded to elect one. But, the faithful refused to comply. Finaly the government came to its sense and restored the churches order. During the take over of EPRDF, a grave mistake was made not just by the government but also by us - the faithful. We should have been refused to elect new Patriarch unles he is departed by death or fair justice for he has been disecrating the church. But, none of these conditions has been met. We jumped with EPRDF's bandwagon and seriously injured our church. For whatever weakneses he may have (the 4th patriarch Abuna Merkorios) he is the legitmate head of the church who shall be reinstated to his place. To be frank, I had been one of the displeases when he was working as the head of the church for the reason that some of his relatives from Gonder has been interfereing in the churches affairs. But, we have to recognize that, the past 21 years has been a great lesson for him to remorse on the past failures. Moreover, he is a true monk who has not been spoiled by the worldly enticement unlike Abuna Paulos. We have to learn one more lesson also from our muslim brothers who refused to buy what government tries to impose on them. This is the right time to claim back the glory of our church. Rise Christians up! and say our church's diginty shall be respected! Our Churche's order must be reinstated! This Gebrekidan mentioned in Berhe's thesis is an ignorant individual who always tried to stir ethinic strifes between trigrians and the other people. 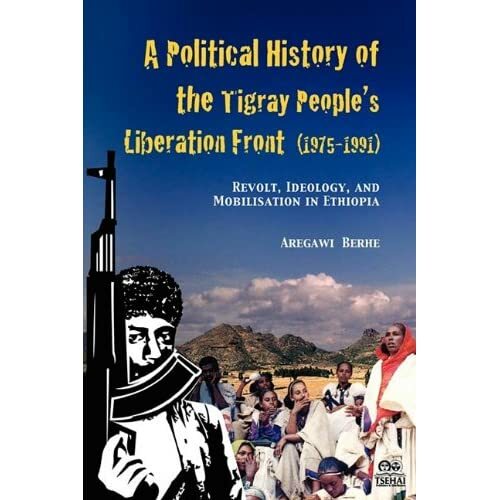 Look at the book - Ye Tigray Hizeb-Ena Ye Temekehetgnoch Syera. Please lets fight first for the canon of the church, not for the best father we can find. 20yrs ago we compromised on our canon law and fantasized with the best educated phd patriarch. It is not only to blame tplf. It is more to blame the psychy of EOC bishops,priests, deacons and faithfuls. When it comes to canon laws it is not only up the patriatch or bishops... to defend it. "It takes the village to raise a child'. Lets learn from our mistakes, heal history and sanctify the future of our spiritaulity. 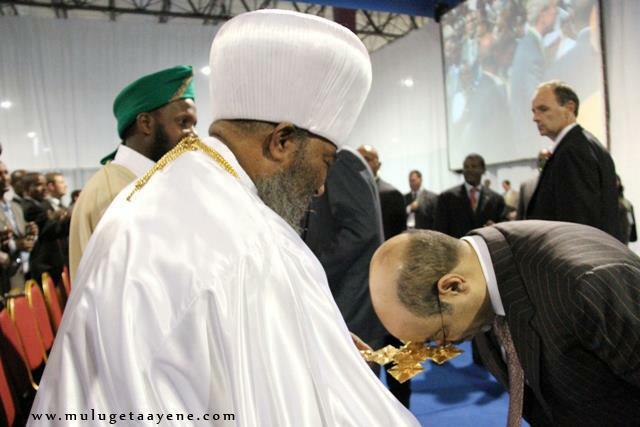 Lets grow up and learn from copts that they refused to appoint new patriarch when Sadat house arrested Abune Shenouda. The past 20 yrs bishops were wrong, MK was wrong, sunday schools were wrong, clergies were wrong, ...we all were wrong. But we can make tomorrow and the day after tomorrow right. Our churche's future is in our hands, ofcourse with the help of Almighty. Lets not go for kilil, as it happend 20 yrs ago. Lets get strong and say we have one and only one patriarch once and for all.I know there are alot of emotions, misgivings,misunderstanding....But we can do it. This is a moment for MK to play a national role. God bless those who are devotedly working for Deje selam. Lets keep on praying to see the hand of God. Beware that those who fight with God will scrumble forever. Long live Tewahdo! The man who sent the last message, you don't even what the difference b/n Mahibere kidusan and tehadeso you are just pasting ur message, I don't think so u are able to comment. Pls read read read read more more more. Dejeselam alamaw alemawi new weys menfesawi? Enih abat ene ergtun balakim kifu nachew (ykr ybelegnna) sibal kereme. Ahun motu. Ere sileEgziabher enasarfachew. Wedeewnet bota hedewal. Libin mimeremir cher amlak geta medhanialem endechernetu beAbreham ekf yanur nebsachewin. Bikefam bilemam bejachew ye fetarin bereket tekeblenal. Sgawedemun kejachew beltenal.Bezalay ewnetegnawin menfesawi hiywetachewn mermro lemawek yemichil kegna wst manew? Motko yesew birtatna dikam adelem yefetari ekid enji. Are wedelibonachin enmeles gobez! Yemiketilewn Patriark geta endimertilin metseley yshalal bay negn. Yetsadik sew tselotko besrawa ejig hylin tadergalech. Are enmen.Metseleyna mamen biyakiten bemerzama bier yemotutn alastegna aln. Enmen entsely. Bemot leteleyun abatim entsely. Menberu yegeta new. Midrawi baleslitan kekrstos belto yegetan menber keto aywesdim. Minalbat hatiyatachin kekefa gin lekifu asalifo endayseten entenkek. Yam hone ya gin menberu yegeta new. Eyandandachin zeregnochina kifuwoch adelenim. Banhon endet yeleloch kifatna zeregnanet tayen? Awo hatie hule yaynun miseso aymeleketim yesew aynin gudf enji. Ya new beyandandachin yemintsebarekew zare. Ere ybkanina aynachinin kesew enansa. Wedelay enangat. Yane geta wedegna ymeleketal. Bahun kifatachin gin geta bimeleketewm anayewm. Ena melkam kewstachin yseweral. Yegetanim sira mastewal yakitenal. Ahun hulun titen entsely bakachu. Silehulum neger entsely. Geta kemdrawyan alkoch ybeltal enmen. lenesum bihonko botawn yesetew esuw Medhanialem new. Sewma min akim alew? Gdyelachihum enmenina bertiten entsely. Geta bemebetachin amalajinet ytadegen. Amen. ውጭ ያሉት አገር ለቀው መውጣታቸው ትክክል አይደለም። ውጭ ያሉት የክርስቶስን መልዕክት በመካድ ለእስላሞች ጂሃድ ድጋፍ ማድረጋቸውም እጅግ በጣም ትልቅ ስህተት ነው። ለፓትርያርክነት ብቃት የሚኖራቸው ከአገራቸው ያልወጡ አባቶች ብቻ ናቸው። እግዚአብሔር ቤ/ክርስቲያናችንን፤አገራችንን በገዳም ፈንታ፡ በኃብታሙ የውጭ አገር ለመኖር ከወሰኑትና በጣም ከተሳሳቱት አባቶች ይጠብቅልን! It is great to read all of the comments and I am very impresed with the depth of our conversation. God is great and I am so very relieved that he passed away, but I am also very sadened. Meantime, the processes that we are going to follow to elect his successor , as many already said it,is very crutial. I have no doubt that TPLF and their junta are already ready to do all their best to put some one alike aba paulos. I have no also doubt that they will put some one they want to use the church as their political machien. This shouldnt be a question at all. The question need to be how much do we love our church? How far can we go to keep our holly, unique church rules and dogma? Will be ready to pay sacrify our selves for the church? If we are true ethiopian orthodox church believers, we need to be ready to pay any price to keep the true rules of the church so that we become united. WHO EVER COMES TO POWER, WE DONT NEED TO INVOLVE, WE HAVE OUR FATHERS TO DO IT. But we need to follow each step so that if any government body interfer, we need to get to the street and die for our church. I would rather chose to die than see TPLF play on my church again. Dont even disccus wethater TPLF will interfer or not. YES they are ready and they will. We need to unite adn unite , no more divission in our church. However, we shouldnt start to name names as a potential successor; the church has its own rules in accomplishing the task. Let that be done by our holly fathers. When it comes to Abune merkorios, I think he should die there before he flee the country and in my opinion he dont need to be considered as a successor. But he needs to be encouraged to go there and be a part of the election and if not elected, he can serve as a hager sibket appas. PLEASE DONT BE FOOLS ANY MORE, BE READY. I think this is the time for us to follow everything and play our role to have our speritual father. If any thing goes wrong we need to be ready to fight it! Lets pray for God to bless us with a good father! LALENIBET ZEMEN MEWAJAW BE ENBA YETEMOLA TSOM TSELOT BICHA NEW. AMLAK YITAREKEN ZEND ENTSELY. DINGIL BEMILJAWA ATLEYEN. MELKAMUN EREGNA GETA YISETEN ZEND MELKAM FEKADU YIHUN. ለፓትርያርክነት ብቃት የሚኖራቸው ከአገራቸው ያልወጡ አባቶች ብቻ ናቸው። አቡነ መርቆሬወስ አገር ለቀው መውጣታቸው ትክክል አይደለም። ሞት ፈርተው ነው እንጂ ወደ ገዳም ከመግባት ይልቅ ወደ ዓለማዊት አሜሪካ የገቡ፤ ማንም አላሰደዳቸው" ስልጣናቸውን አላግባብ ተቀምተዋል? አዎ በዚያ እንስማማለን። ይሁን እንጂ ወደ አሜሪካ ሄደው ሌላ ሴኖዶስ በሃይማኖታችን ላይ መመስረታቸው ትልቅ ስተት ነው። አገራችን እንኳን አቡነ መርቆሬወስን ወንበዴ የሚያስጠጋ ገዳሞች ሞልቷታል። ከ45ሚሊዮን በላይ የሚሆነውን የኦ.ተ.ምእመን ከጉዳይ ሳይጥፉ "የኢ.ኦ.ተ.ቤ.ክ በስደት ላይነች" እያሉ ሀይማኖታችንን ከሁለት ከመክፈል ለምን በገዳም ሁነው ለሕዝባቸው አቤት አላሉም። የመረጡት ይህችን አለም ነው፤ እንደ ምርጫቸውም እየኖሩባት ነው። ዛሬ ግን አንበሳው እስኪሄድለት እንደሚጠብቅ ጅብ በአሜሪካ ዋሻ ተደብቀው ኖረው ቀን የወጣ ሲመስላቸው ብቅ ሊሉ ከፈለጉ፤ በዚህ እግዚአብሔርን እና የ ኦ.ተ ምዕመንን ደስ ሊያስኙት የሚችሉ አይመስለኝም። ክርስትናችን ተጠብቃ የኖረችውኮ ስንቶች ጻድቃን አንገታቸውን ለሰይፍ፥ ስጋቸውን ለእሳአና ለአውሬ እየሰጡ ነው፤ ታድያ ገዳም ገብቶ ከመታገል ይልቅ አሜሪካ ገብቶ ዶላር መሰብሰብ??? watch this how his holiness Abune Merqorewos forcefully removed by the Government in 1991. Well written. Let's pray for our beloved church. God has answer for our question. The article is based on one person thesis. He is already a looser what ever he says is not credible. His comments and views were always distractive.Instead of relaying on him it would have been better if you refer other sources. God is in control of everything. He knows who deserves this post. Nothing is not happened without His will and it won't in the future too. አንድ መሆን ከተሳናቸው እንጸልይ/ጸልዩ ማለት ምን ማለት ነው? ሰላም: እርቅ: ፍቅርና: አንድነት ካልተፈለገ ጸሎት ለምን አስፈለገ?